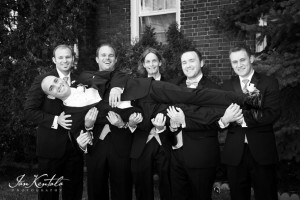 I have been a wedding photographer for a LONG time: since the 1970s. Sometimes I think I have “seen it all”: animals as attendants, grooms on horses, grooms that didn’t show up for the two hours of photos taken before the ceremony (two), runaway brides (one), runaway grooms (one), and–naturally–shockingly embarassing drunken toasts. 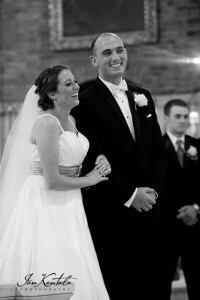 But let me tell you a funny story about my wedding last weekend. We idly wondered, had it been a funeral, a first communion? Then at 11:50 a.m., a limo pulled up. “Wow,” I exclaimed to Molly. “Emily didn’t tell me she was arriving in a limo!” We jumped out, ready to photograph her arrival, but lo and behold, the limo door opened and out jumped a videographer and photographer, followed by… huh?… NOT MY BRIDE!!! Well, it was the same church we were at! I had to inform her there was a wedding about to begin at noon. And not hers! She shouted, “That wedding was supposed to be an hour ago!” They had just informed her of this added event the night before at her rehearsal, but they had assured her that wedding would be cleared out by noon. Long story short: The bride moved and forgot to update this information with her vendors (limo driver included). He waited for 30 minutes at her old address, and then–not knowing what to do–went to the church, where her relatives informed him of her NEW address. So he rushed to go get her, but this was already an hour later. 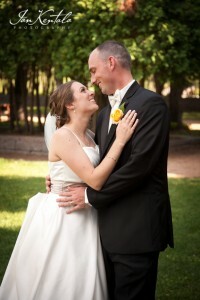 All I can say is thank goodness it was not the day before, when it was 102 degrees and unforgiveable humidity. 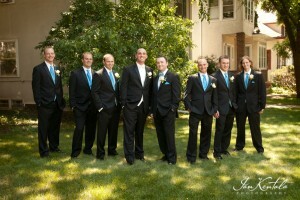 We had to take ALL the “before” group photos outside at the priest’s residence next door. We were limited to a few small patches of shade, one tree and some bushes. And do you think they might have hurried along the late late wedding? No way! It went on endlessly for an hour. Emily and Mike’s guests were arriving and the other wedding hadn’t let out yet! Luckily, this couple was very laid back and understanding (unlike their neurotically nervous photographer who was trying very hard NOT to act neurotic and nervous!). 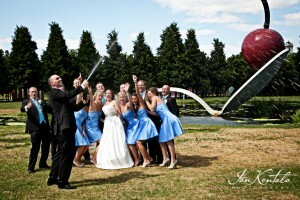 And nothing was going to get in the way of them having a very FUN wedding! 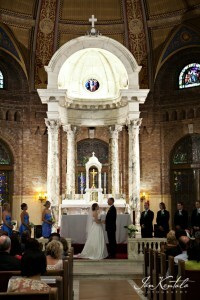 Actually, the non-air conditioned church was like an oven, and it was beautifully balmy and breezy outside. So most everyone was just fine with the outdoor pics. 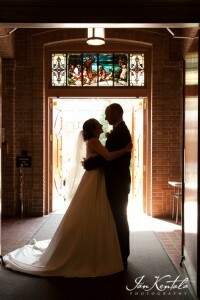 We did take some photos in the church afterwards. Emily and Mike were high school sweethearts. 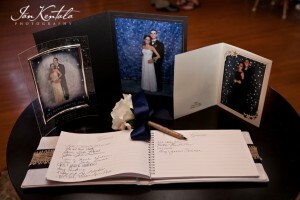 They went off to different colleges but love persevered over the years and a wedding date, some 12 years later, was set. See the first photo below of the very YOUNG couple at their tenth grade prom in 2001! 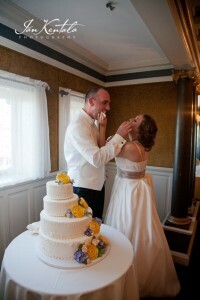 This couple made it clear to me that their goal for the wedding day was to celebrate with family and friends. Yes, they wanted great photos, but they didn’t want to spend large blocks of time taking pictures. They rented a limo bus and wanted to spend the time after the wedding riding around the lakes and having fun with their friends. We did have about a half-hour at the Minneapolis Sculpture Garden and took some fun shots there. My favorite is Mike spraying a bottle of champagne. Look at the girls cowering together trying to avoid the spray! Sometimes a wedding photographer just has to go with the flow. It certainly worked on this day. As they old adage goes, all’s well that ends well (big relieved sigh). Formal dance photo from throughout their high school years. Great dresses for a summer wedding! And check out the darling flower girl! 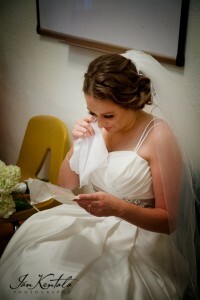 Before the ceremony, Emily was surprised with a hand-written letter from Mike. 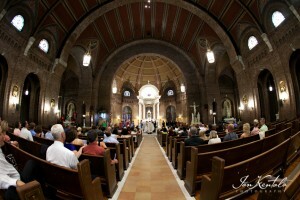 Fisheye view of The Church of the Incarnation. A beautiful setting for a beautiful day. Sharing a laugh during the ceremony. 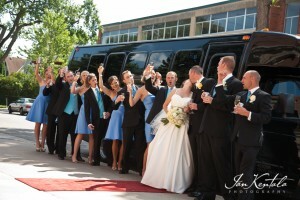 Their wedding party and limo bus is waiting for the couple just outside the church doors. 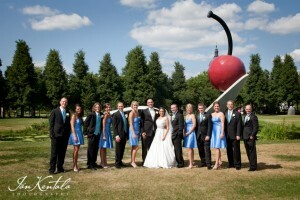 The famous “Cherry and Spoon” installation at the Minneapolis Sculpture Garden. The exact spot where they had prom pictures taken in high school. Don’t you love their expressions? 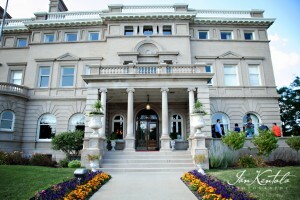 The Semple Mansion in Minneapolis. 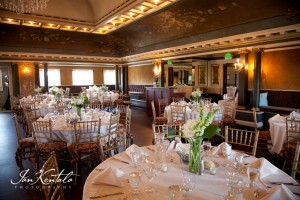 The ballroom upstairs at Semple Mansion for dinner and dancing. 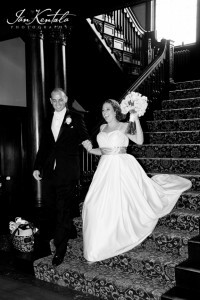 Making a grand entrance into their reception. 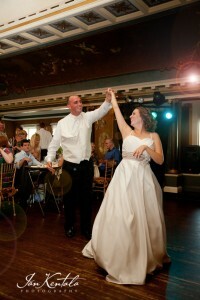 Awesome couple, fun day, wonderful memories. Beautiful! Can’t wait to see the rest! Thank you for a great job! I’ve looked at those pictures so many times and all I do is just smile at all the joy I see. 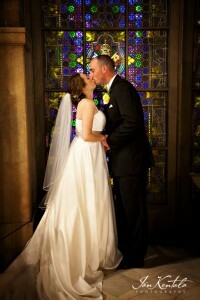 Happily ever after never looked so good!